This year’s Wikimania conference in Montréal was — for me — the most intense yet. I discovered many years ago — after showing up to a few New York City Wikipedia meetups — that Wikimedians are my tribe. We’re nerds; we’re weird; some of us just can’t resist arguing about copyright for hours. Our community culture is far from perfect, but we’re part of it because we believe that knowledge is important, and that everyone should have access to it. The people who are really dedicated to that idea tend to stick around a long while. So each time I come to Wikimania, the density of people I know and love and have missed since my last Wikimania is even greater. I mostly remember it this year as an endless series of hugs. 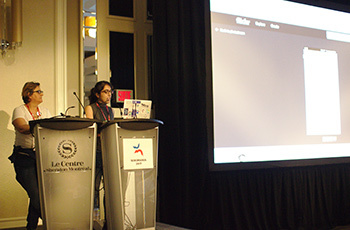 Camelia and Sejal present their Dashboard work at the Wikimania Hackathon Showcase. For the main conference, my initial plan was to stick to the hallway track, but my curiosity got the better of me for more excellent sessions than I expected. From research to anti-harassment to fundraising to library outreach to activist campaigns like Art+Feminism, there are more exciting projects going on right now than ever — especially in the realm of nurturing first-time Wikipedia contributors. That’s been central to my work at Wiki Education (and at Wikimedia Foundation before that), and it was gratifying to find so much enthusiasm for the Dashboard system we’ve been building. We realized early on that many of the problems Wiki Education has been tackling are not unique to our programs, but adapting the technology for more general and global uses has been a long process. Programs & Events Dashboard is a project that kicked off two years ago at the Wikimania 2015 hackathon, but only in 2017 has it come far enough along that it’s really hitting its stride. I’m excited — and with all the Wikimaniacs I talked to who plan to use it, more than a little nervous — to see where it goes by Wikimania 2018. This was my first Wikimania conference. It was so right on. Wonderful being around people who really care about something tangible and meaningful.